wall hangings are specified. In Act 2, houses on left and right, Autumn leaves, monastery in background, are as the composer directed it. The curtain rises on the Oprichniki, or Tsar's Bodyguard, Gryaznoy recounting his youthful debauchery, but he's in love now with the beautiful Marfa. Unfortunately for him, she's in love with her childhood sweetheart, Lykov. Servants put torches in the holders, and the lights come up on the interior of what looks like a well appointed hunting lodge of the period. The Oprichniks and others arrive and the male chorus concludes with a tremolo effect that sounds almost like a CD skipping. It's the first of numerous exceptional vocal effects for the evening. away. Olga Borodina is sweet and tender as she mourns the loss of her love, but there's a foreboding and edge as she overhears Gryaznoy ask Bomelius for a love potion, and she becomes hard as nails, swearing revenge on her rival. It's fall in the village in Act 2. The Oprichniki are intimidating as they sing of their prowess. When they leave the villagers tell us, "some poor wretch is going to lose his head." Marfa and Dunyasha are alone, and they sing of love. The Tsar enters, disguised as a huntsman, and stares at and through Marfa. The girls are frightened and Marfa says "My blood runs cold." When they go in the house, Lyubasha lurks around, looks in the window, and swears her revenge on her rival, as she hears the girls' laughter inside. She gets Bomelius to substitute a slow death potion for Gryaznoy's love potion. It's a dark night with a single light burning in the background as the broken and revengeful Lyubasha contemplates, "see what I have come to." golden treasury." He slips the slow death potion, thinking it's the love potion into Marfa's cup, and urges her to drain the last drop, in the ancient tradition. When the Boyars come and announce Marfa will be the Tsar's bride, she shrinks back, then steps forward. Lykov falls to a knee and she reaches out to him in supplication. The final act opens like the third, in front of the palace. This time the curtain rises into a room in the palace. The courtiers are there, but Marfa is ill. Her father and brothers are all Boyars now. Kevin J. Langan's Sobakin has all the material wealth he ever wanted, and the things that satisfy his vanity make people envious of him. His heart breaks though, because of his daughter's illness. He kneels as his bass aria trails away to a single note that he holds for about eight bars in another amazing vocal moment. more. Lyubasha enters and tells how she switched potions. Marfa sings sweetly to Vanya about how they played in the garden when they were young . . . "shall we play tag?" She's triumphant in her madness, soaring ecstatically. She smiles at the sky, wrinkles her nose like a little girl letting you in on a secret and collapses in a heap. Anna Netrebko put on a show like I have rarely seen in any medium. 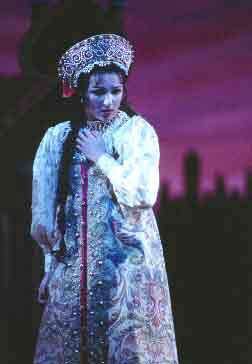 If Renee Fleming is "The Beautiful Voice," which she assuredly is, then Anna Netrebko would have to be "The Golden Voice." She sings with an effortless power, smoothness, beauty, and grace that is second to none, and acts with the ease and charisma of a Samuel Ramey or Rodney Gilfry. 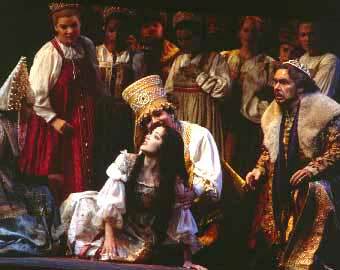 In Act 2 she sings a beautifully sweet aria of her love for Lykov. He joins her for a soaring duet. She's having real fun and experiencing genuine joy and she sweeps you up in it entirely. On top of all this, she has movie star good looks, plays beautiful women and you don't have to us e any imagination. 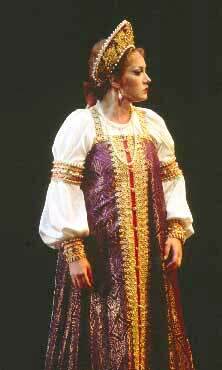 This has to be like seeing a young Kiri Te Kanawa, but I don't know if Kiri was this developed at this stage of her career, and she certainly wasn't as vivacious and charismatic. 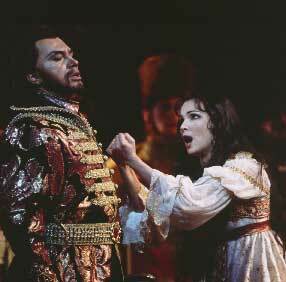 It's almost scary to imagine how good Netrebko will be in five years or so. Her enthusiasm was underscored in the curtain calls as she was totally animated, smiling out at the audience, leaning forward, brushing her hair back, and, after she greeted conductor William Lacey, he took his bows while she was in the background jumping up and down and clapping her hands. Anna Netrebko stole the show in this all around outstanding production of Nikolai Rimsky-Korsakov's "The Tsar's Bride" at The San Francisco Opera.